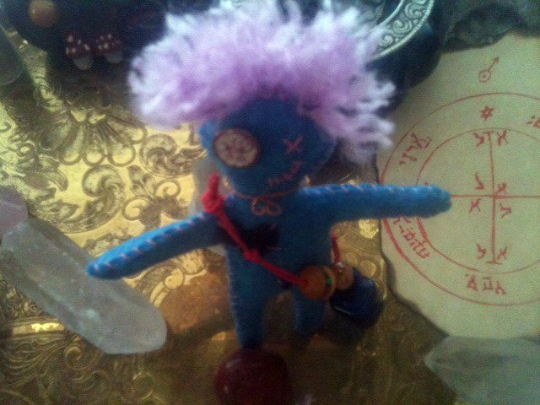 Poppets and dolls have been used to effect change and make connections for about as long as there have been people. They serve as a link between you and a person, spirit or divinity. Sometimes they are used for healing. Sometimes they are used blessing. Sometimes they are used as pathfinders. Sometimes, just sometimes, they are used for darker cathartic purposes. These poppets are helper dolls born out of a childhood story that insisted upon jumping out of the pages. 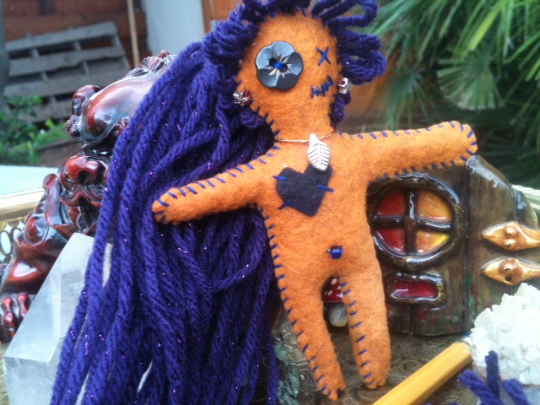 Each Oddling is different and hand stitched with love, blessed, and enlivened through traditional witchcraft means. 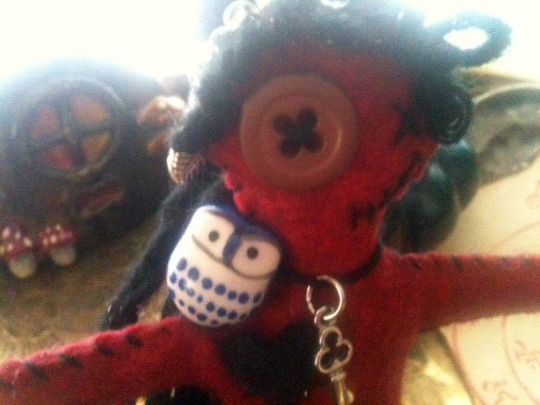 Therefore, the inventory here will change as new Oddlings are brought to life and others find homes in comfy pockets. 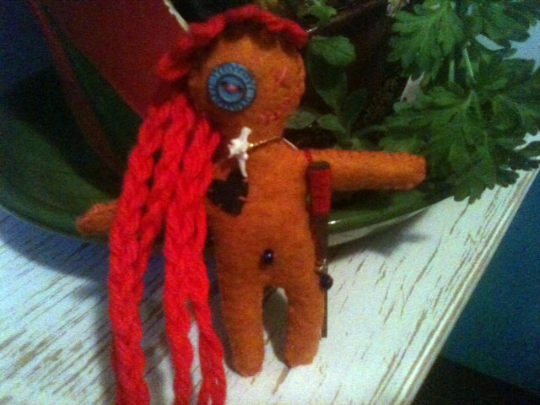 I hope Baba Yaga finds these Oddlings adequate enough as not to devour me and Vasilissa would stick one in her pocket. Most of all, I hope that when you put one in your pocket, you find your way through all the challenges the seen and unseen world throws your way. Rosemary to spark the memory’s strength and frankincense to open its gate. Mustard to keep the mind’s engine moving and crushed pearl to dive in deep. Rue to ward second guesses bane and heart of gardenia to usher in peace. Meet Chloe! Chloe has her hair pulled back into a pony tail and is ready to get down to business with your studying practice. She thinks with a pencil and inspires doodles that inspire you to think in different circles. She makes the perfect helper to anyone who is striving to do well with tests and quizzes. Nothing would please her more than to go on a pocket parade in a library or school hall! Just don’t expose her to too much dust. . . she hates dust. Book dust is the worst. High John the conqueror, the master of victory, with leaf of the bay tree and the blood of the dragon to walk by her side. Blossom of calendula for justice, and blossom of cat’s claw to see the right path, and basil to seal it all up. Her spine is of basil branch and he is sprinkled inside with powdered pearl and black tourmaline. Eldair walks softly through the world and finds the most direct route to victory. Her owl companion brings to her messages from other realms and swoops silently and swiftly upon the enemy should there be one to be found. 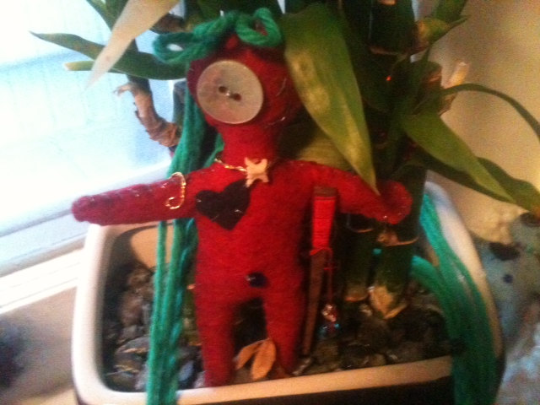 She enjoys an offering of fresh water and flowers and a good smudging with fine incense is always a great treat. Even in Faery there is a desert, and Tanque lives there in the dunes where the wild wyrms rule and the monsoons sculpt the land. A mighty protector and champion these desert fae are. With her holy nail and back bone of sow weed she is not likely to fail you. Tanque is a stealthy scout and can penetrate any foe’s defenses. She may be sweet, but she has a heavy spice to her as well. She prefers spicy offerings, dark chocolate, and sunlight. He wears the tattoo of the Wyrm made of blood of the dragon ink and a vertebrae of the rattle snake wyrm. Even in Faery there is a desert, and Roe lives there in the dunes where the wild wyrms rule and the monsoons sculpt the land. A mighty protector and champion these desert fae are. With his holy nail and back bone of sow weed he is not likely to fail you. Roe is not only a fierce champion and protector, he is swift, light on his feet and is his clan’s messenger as marked by the crow feather in his hair. He prefers spicy offerings, dark chocolate, and sunlight. He wears the tattoo of the Wyrm made of blood of the dragon ink and a vertebrae of the rattle snake wyrm. High John the conqueror, the master of victory, with leaf of the bay tree and the blood of the dragon to walk by his side. Blossom of calendula for justice, and blossom of cat’s claw to see the right path, and basil to seal it all up. His spine is of basil branch and he is sprinkled inside with powdered pearl and black tourmaline. Tree Leaper is a sharp as a fine needle and as agile as a cat. From his vantage point in the trees he can see the path that will lead you to victory! He prefers to be offered smudgings of fine incense and left an offering of something boozy in his little bottle. After all, victory deserves a good celebration!